Does Matthew 7:21-27 scare you? Perhaps you should take a long look at your relationship with Christ! Dave: Matthew 7:21-27 contains some scary words from Jesus! Dave: What did he say to the people who didn’t get into Heaven? Did he say, “You were too bad”? Jeff: No. Did he say, “You believed the wrong things”? Dave: No. He said, “I never knew you”. Jeff: Likewise, there is vast difference between believing in God or good works and JESUS KNOWING YOU. Dave: It’s a relationship thing. Jeff: Next Truth Shot – how does that relationship work? 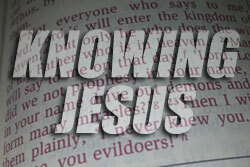 and how does Jesus know us?